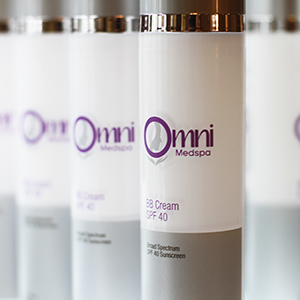 Omni Rx Skin Care is our own custom line of skin care products to help with all skin care concerns. 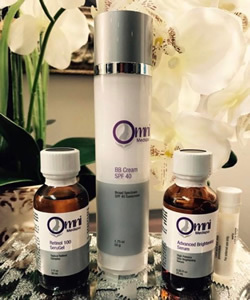 The Omni Rx products are recommended for all skin types and tones. We can customize the product to fit your individual needs and results. Our products can be compounded to enhance your results. Body Silk – our age defying all over body treatment with potent but gentle retinoids, antioxidants and lipids. This rejuvenating serum leaves your skin looking and feeling beautiful. Peptide Gel Complex – highly concentrated hyaluronic gel enhanced with B vitamins and peptides. C+FE Serum – high powered antioxidants to fight off aging. Revitalize Eye Cream – tired dark circle? puffy eyes? Aging? Clear and Bright Gel – perfect for acne, normal to oily and pigment issues. Great for tone and texture concerns. Advanced Brightening Serum – high powered skin brightening serum fortified with key antioxidants. 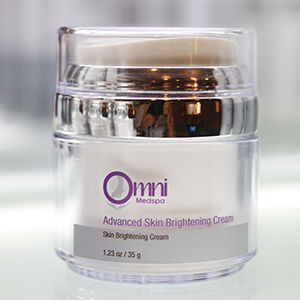 This product can be compounded for enhanced brightening. Retinol 100 SeruGel – not for sensitive skin – this powerful gel helps even skin tones and reduce wrinkles. Your esthetician will consult with you on what skin care products and regimen will deliver the best results based on your skin type, tone, and issues.